OSU's Joyaux goes off for goalie interference. 4:11 left in the second, UW trails 2-0. Shots on goal 10-4 in the second for OSU. UW's top power play now has Linhart instead of Davison. Others: Kunin, Hughes, Frederic, Besse. Kunin hits the left post from the right side. Kunin with a wicked wrister that hits the far post. Frederic puts on on net and Kunin tries to slam home the rebound but Tomkins continues to be a stone wall. Tomkins makes saves on Frederic and Kunin. Other PP unit: Davison, Wagner, Johnson, Ustaski, Labosky. Short-handed goal for OSU makes it 3-0 with 2:21 to play. Short handed goal as Jobst ran an odd-man rush with Kearney who buried it. 3-0 Buckeyes. BUCKEYES GOAL: A 2-on-1 short-handed rush ends in Brendon Kearney scoring high. 3-0 OSU over UW with 2:21 left in the second. Badgers' power play also expires. Kunin just denied twice in a row down low. He's had two excellent chances in the past few minutes. END 2: Ohio State leads Wisconsin 3-0. SOG 23-18 for OSU. Badgers playing themselves out of at-large consideration this weekend. Second period comes to a close, Buckeyes leading 3-0. 13-9 shot advantage for OSU that period. Mike Eaves and Mark Johnson get big cheers from the crowd as the 1977 #Badgers national championship team is recognized. Josh Healey has five blocks tonight. OSU blocked ten shots in that period. OSU took 15 total shots that period. 13 of them got on net. UW took 26 total shots. 11 got on net. Ohio State has blocked 18 of UW's 50 shot attempts through two periods, same number as Badgers have on goal. UW and OSU back out for the third period. Badgers trail 3-0 with OSU leading SOG 23-18. If Badgers don't make a huge comeback here, they probably just played themselves out of at-large bid consideration. Ohio State leads Wisconsin 3-0 as the third period begins in the regular-season finale. Third underway. Probably the most important period of hockey for Wisconsin in two years. UW has Ustaski, Frederic and Kunin out to start the period, but Ustaski gets blasted from behind by Healey and is down on the ice. Badgers immediately get penalty on a huge hit into the boards on Ustaski. Badgers' power play coming up just 14 seconds into the period. OSU is called for boarding. Ustaski is able to skate off to the bench. Healey gets 2 for boarding, putting UW on the power play 14 seconds into the third. Josh Healey, who's been suspended twice this year, delivered the hit and is now in the box. Ustaski was down on the ice for a while but skated to the bench on his own power. UW fails to convert on the man advantage and teams are back to even strength. Wisconsin doesn't really get a good chance on the power play. Badgers 0-for-4 on the power play. Buckeyes up to 22 blocks. Michigan beats Penn State 4-0. Badgers get the Ohio State-Michigan State winner on Friday. Minnesota gets the Penn State-Michigan winner. 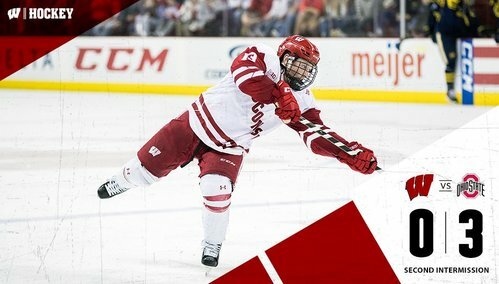 BADGERS GOAL: Matt Ustaski scores his second of the weekend -- UW's only 2 goals -- and OSU's lead is 3-1 with 15:24 left. Ustaksi rips one home from the wing and Wisconsin is within two. UW gets on the board with 15:24 left in the 3rd. OSU leads 3-1. Looks like the Buckeyes are challenging the goal for offside.